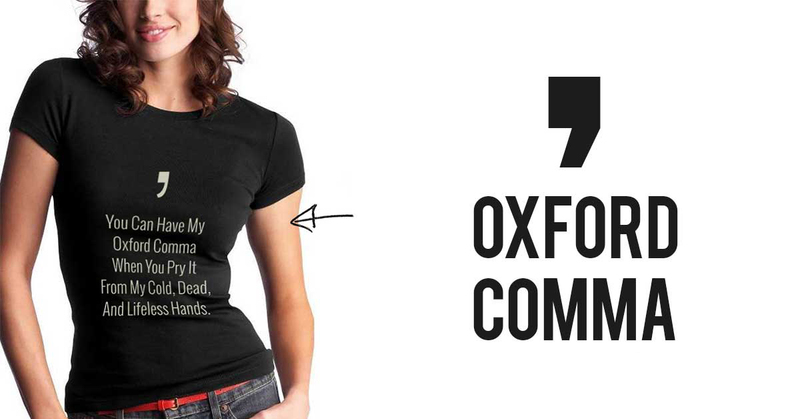 The Oxford Comma: Essential or Inconsequential? So says Lynne Truss, author of the hugely successful punctuation bible “Eats Shoots & Leaves”, in reference to the surprising strength of opinion surrounding the use of the Oxford comma. 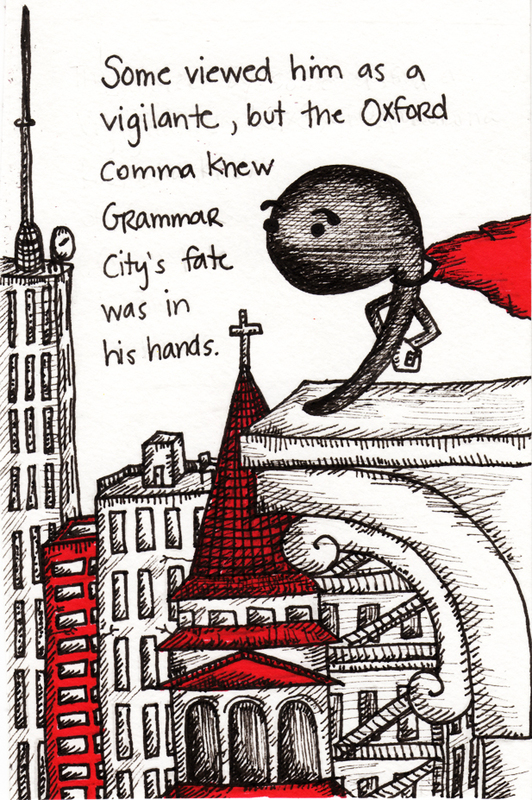 The alleged importance of the Oxford comma has been humorously depicted in numerous internet memes, while its debatable significance has even been the subject of a popular song by the band Vampire Weekend. But why is it that people have such robust opinions about such a tiny and seemingly harmless bit of punctuation, and has this controversial comma had its day? In this article, we look in detail at the arguments for and against the use of the Oxford comma and try to get to the bottom, once and for all, of whether or not we really need it. What is an Oxford comma? The Oxford comma is also used in exactly the same way in lists in which the conjunction is the word “or” or “nor”. The Oxford comma is technically called a “serial comma”, or “series comma”, but it’s become popularly known as the “Oxford comma” thanks to its famous use by Oxford University Press, a publishing house in Oxford, the style guide of which has required the use of an Oxford comma since as far back as 1905. The Oxford comma is occasionally also known as a Harvard comma on account of its well-known use at Harvard University Press. Who uses Oxford commas and who opposes them? Traditionally, the omission of the Oxford comma has been more common in newspaper publishing, where strict character limits are required in the narrow confines of printed columns. There is no consistency in its use or omission when looking at historical texts (it’s been used for centuries, but people have also been omitting it for centuries), but today, its use is generally more common among American style guides than it is among British ones. The Times and The Economist, for instance, are both against its use. Many well-known American guides, such as The Chicago Manual of Style, advocate it, though there are notable exceptions, such as the Associated Press Stylebook. Others, such as The Guardian, are more flexible, arguing that it should be used only in situations when it is required to avoid ambiguity. Interestingly, many languages – including French, German and Italian – do not use the Oxford comma at all. Many people who have a passion for good grammar argue strongly in favour of the Oxford comma, lamenting the fact that many style guides have unceremoniously binned it. Let’s look first at the reasons why so many people still advocate the use of the Oxford comma and see if we can understand why supporters almost militantly defend its use. The biggest argument in favour of using the Oxford comma is for clarity. Sometimes, many people argue, the Oxford comma isn’t just a stylistic feature, but an essential one, as the meaning of a sentence can be altered without it. It is therefore important for removing potential ambiguity that can spoil the clarity and elegance of your writing. With the Oxford comma, it becomes clear that gifts are being sent to her sons in addition to being sent to two other people called Kate and Sophie. It’s a fine difference, but an important one, and it’s a good illustration of why grammar purists argue that the Oxford comma makes one’s writing more precise and deliberate. The reader can thus see that these are individual topics to be discussed, regardless of whether they have any pre-existing knowledge of Quantum Mechanics or what these subjects are about. Without the Oxford comma, one might surmise that the Copenhagen interpretation relates specifically to the mathematical formulations, while what is actually being communicated is that these are discrete subjects. Others add to this persuasive argument in favour of the Oxford comma by pointing out that its use more closely matches the spoken rhythm of a list. To see what we mean, try reading out a list of items and see how your rhythm alters when you reach the end of it. Did you add an extra pause to indicate that the last two items on the list were two separate things rather than combined? The purpose of commas is to separate and indicate short pauses between clauses, to make your writing easy to read and understand; we do exactly the same thing when we are speaking out loud. When you’re reciting a list of things out loud, the chances are that you probably would put a short pause before the final item, and the Oxford comma reflects that. The use of the Oxford comma, many people argue, is overly pedantic, and in some situations, its use can sound pompous and hypercorrect. It is usually perfectly possible to discern the meaning of a sentence without it. It’s pretty obvious, for example, that the girl in the example above would enjoy cake and chicken as two separate foods, not together. To suggest that readers need an extra comma just to be able to understand this is surely underestimating the intelligence of one’s readers. What’s more, adding the extra comma when it isn’t necessary arguably disrupts the flow of the sentence, and those opposed to the Oxford comma might argue that it sounds more natural to read it without the short pause before the final item. It’s easy to read this sentence as meaning “We are working with two people – a farmer called John and another person called Tom”. In this case, the Oxford comma before the final conjunction has added confusion, because it means that “the farmer” can now be read as an apposition. If the meaning of the sentence was actually that we are working with three people – John, Tom and a farmer – then either removing the Oxford comma or rephrasing altogether would be more clear. What’s more, it can be argued that the conjunction in itself provides enough of a separation between the final two items. It is, after all, what the conjunction is there for, and one could argue that the comma is therefore superfluous – even tautological (a tautology, for those not in the know, being a stylistic error occurring when there is an unnecessary repetition of meaning – but that’s a whole other linguistic minefield). If there really is ambiguity when an Oxford comma isn’t used, rephrasing a sentence can often be a better option than using an Oxford comma. For instance, in the last example, we might say “They sent gifts to her sons and to Kate and Sophie”. Some might counter this argument by suggesting that adding a simple comma takes less time than rephrasing a sentence, but if the end result is a more elegantly worded sentence, then one could equally well argue that it is time well spent. 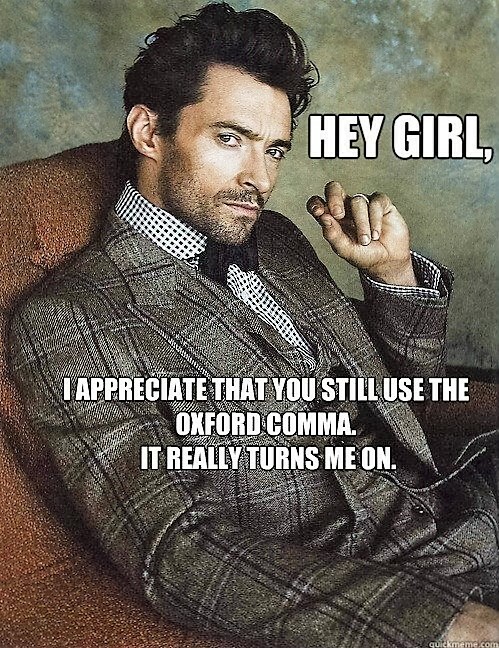 Is use of the Oxford comma ultimately just a matter of personal preference? It’s easy to end up sitting on the fence when it comes to the Oxford comma; its use often is a matter of preference, and this is reflected in the fact that some style guides insist on its use while others insist on it not being used. But perhaps sitting on the fence is the right position to take when it comes to the Oxford comma, because deciding on a case-by-case basis whether or not to use it is arguably a more intelligent approach than advocating its blanket use or banning it completely. To throw yet another spanner into the works, and in favour of using the Oxford comma on a case-by-case basis, still others argue that the Oxford comma isn’t necessary when listing items that are related to each other, but it is when introducing items that are not related to each other. To follow this argument, you might talk about “sheep, pigs and cows” without an Oxford comma, because they are all farm animals, but you would use one when referring to unrelated items such as “tables, clothes, and food.” However, this idea is not an accepted rule, and seems more of a personal reimagining of Oxford comma usage. Irrespective of this particular line of argument, flexibility seems an appropriate response to this surprisingly complex punctuation issue. That’s because although some might argue that rephrasing removes the need to quibble over its usage, there are still some situations in which the use of the Oxford comma is warranted and others in which it is unnecessary. One might also argue, though, that consistency is important, and that it is better to choose whether to use it or not and then apply that rule consistently, at least across the same document if not across all wider publications as part of a house style. In the absence of any hard and fast rules in favour of the Oxford comma or against it, it seems that it will continue to be one of those grammatical nuances that’s subjective enough to provoke heated debate. Where do you stand on the troublesome Oxford comma? Share your views for or against in the comments below and let’s see if we can reach a consensus on this controversial comma.